Add The New Yorker to the list of notable media victims of Ryan Lochte's sensational story about being held at gunpoint in Rio. On Monday, the magazine printed a cartoon on Monday depicting a tongue-in-cheek suggestion for tracking down the alleged perpetrators (e.g. the individual who had stolen all those medals, the cartoon implied). But on Friday, The New Yorker issued a follow-up cartoon to wipe the proverbial egg from its face — and the admission is actually quite charming. Here's what went down: Last Saturday night, a group of U.S. men's Olympic swimmers, Ryan Lochte, Gunnar Bentz, Jack Conger, and Jimmy Feign, went out together to Club France in Rio, a popular nightlife scene for Olympians during the games. On Sunday morning, reports surfaced alleging that the swimmers were robbed at gunpoint by men posing as cops. 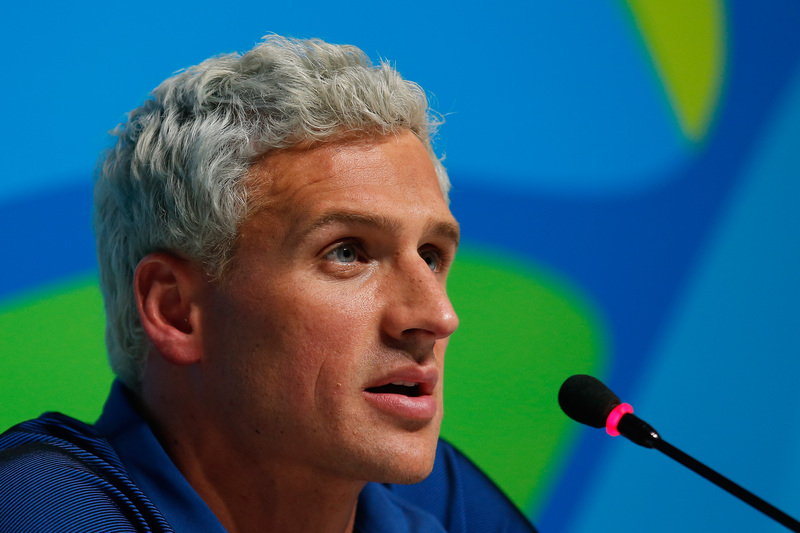 Lochte even went on Today and described the stick-up in dramatic and vivid detail. However, the story didn't pan out. Apparently, instead, Lochte was vandalizing a bathroom of a gas station and in retaliation, an armed security guard pulled his gun trying to get the men to leave, according to sworn statements by Lochte's teammates. Officials got suspicious when a variety of details didn't add up. According to the New York Times, it started with a disputed time frame: Lochte claimed the group left the club at 4 a.m., but security camera evidence showed that the true time was almost two hours later. Cameras also contradicted the story, since the group seemed to be unfazed and joking with one another when they returned to Olympic Village after their night out. The final straw was when the wild-goose chase the authorities were on wasn't turning up the people the swimmers had made up. There was not only no trace of the fraudulent policemen Lochte described, but also no sign of the cab driver who would have seen the whole thing. Like many other members of the media, Bustle included, The New Yorker fell for the tale. In the beginning of the week the magazine published a sketch by Benjamin Schwartz wherein the cartoonist boldly takes the Olympians side and portrayed a potential clue to finding the alleged perpetrator(s) — a bit of a brave move to be backing up the reality TV star who popularized his bro-ish catchphrase "Jeah." This topic is especially sensitive for Brazilian officials since the Rio Olympics has been under particular scrutiny due to lapsed security in the city during the Games. Lochte has since publicly apologized in an Instagram post. Some estimate the incident will cost him millions in endorsement money.